Happy Valentine's Day! These are the treats that my daughter and I made for her dance classmates. Easy peasy this year-I waited until the last minute, as usual, so I needed something quick. These were quick. I just used Jin's idea for bag toppers and this tutorial. This graphic is great to use with Hershey Kisses, and since we are farmers, it couldn't be more perfect! That is so funny! LOL! Cute treat bags! What a cute idea. These look perfect! bwahahahaha tooo adorable. Love it. Can't ever go wrong with kisses. Perfect and precious!!! Love the little pig on here - the treats look yummy too! Great idea. These are adorable! I love the cute saying. these are just so adorable!!! love them!! Treat toppers is an excellent way for us procrastinators to make something last minute, teehee. 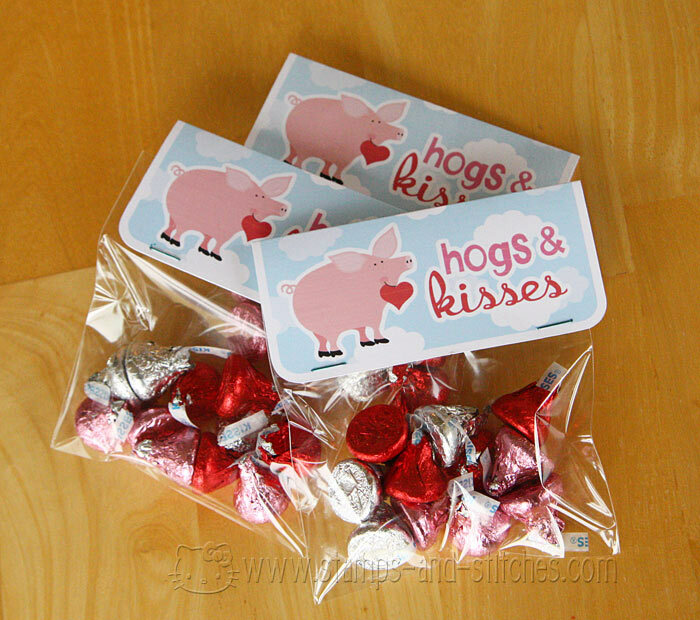 Love the hogs and kisses, to funny. I thought of you the other day when I was in Michaels - they have an entire Hello Kitty section! All the Smash type books and everything to go with it - from tapes to paper clips to just about everything, all HK - it was precious! Gale, these little treat bags are too cute! What a fun project, I bet these were a big hit! Hi Gale, I just thought I would let you know I tagged you in a blog tag. These are super adorable! I love his idea and will definitely check out the tutorial. Perfect for any holiday or birthday parties! How stinkin' cute is this. I bet the dance class really enjoyed their treats.